The Palmer House Hilton Hotel, an iconic, historic downtown Chicago hotel offers guests the opportunity to relish in the grandeur of tradition while experiencing an infusion of modern elegance. 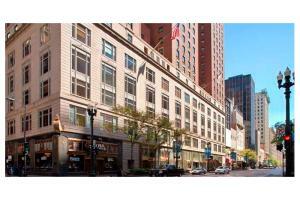 The hotel is located within easy reach of Millenium Park, the Magnificent Mile and Lake Michigan. Every tastefully-appointed room features Hilton's new Serenity Dreams bed.